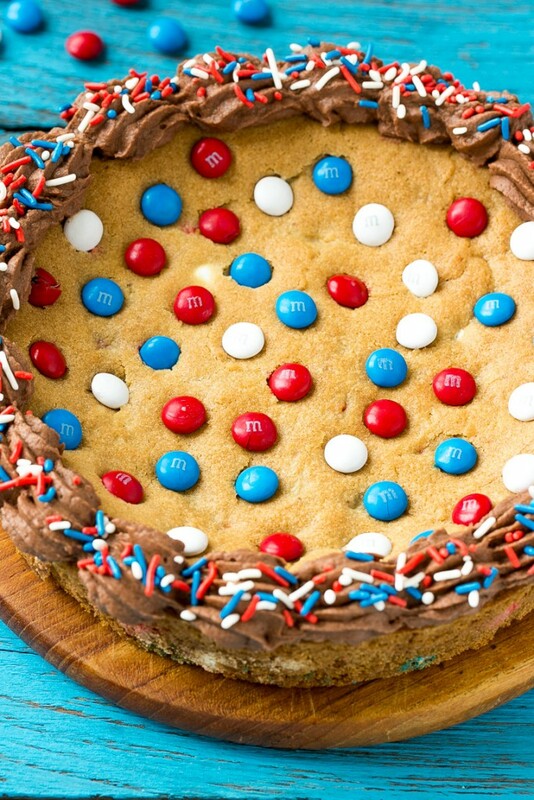 This recipe for a patriotic cookie cake is a giant brown sugar cookie that’s loaded with Red, White & Blue M&M’s and finished off with creamy chocolate frosting and sprinkles. The perfect treat for summer entertaining! This post is sponsored by MARS. All thoughts and opinions are my own. Thank you for supporting the brands that make Dinner at the Zoo possible! The 4th of July is one of my favorite holidays – our town has an annual parade that I’ve been going to ever since I was a kid and we always host a barbecue in the afternoon for family and friends. Now that I have children of my own, we really go all out when it comes to celebrating holidays, and for 4th of July it’s red white and blue everything! This patriotic cookie cake is the perfect festive no-fuss treat for summer entertaining; it’s become a family tradition at my house! It’s colorful, delicious and of course quite festive. While individual cookies are great, it’s a lot of work to make dozens of balls of dough and bake batch after batch in the oven. This cookie cake looks impressive and unique without all of the work of traditional cookies. 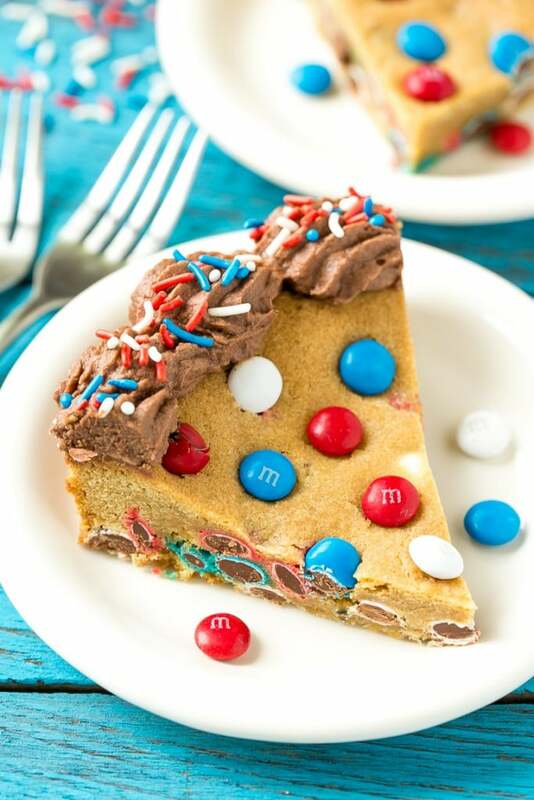 I use a homemade brown sugar cookie dough base and load it full of our favorite Milk Chocolate Red, White & Blue M&M’s. I buy my M&M’s at Target, they always have a great variety of flavors and sizes. I put Red, White & Blue M&M’s both inside the batter and also on top of the cake for decoration. The cookie cake is finished off with a easy and simple chocolate frosting and some patriotic sprinkles that I also picked up at Target. I used a piping bag fitted with a star tip to pipe the frosting onto the edge of the cake in a decorative fashion. If you don’t have a piping bag, you can put the frosting into a large resealable freezer bag and cut one corner off to pipe your frosting onto the cake. 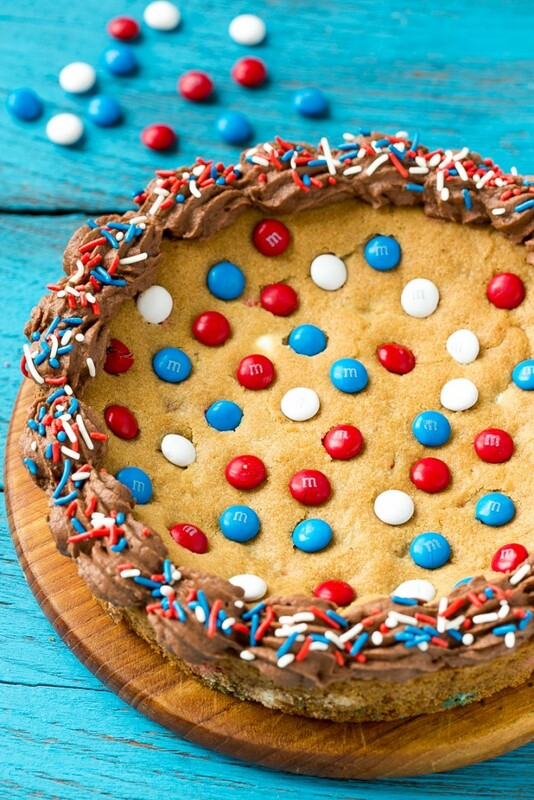 This cookie cake is crispy on the outside, soft and chewy in the middle, and the M&M’s add so much amazing chocolate flavor. This cookie cake can actually be made up to 2 days in advance, just store it in the refrigerator until 30 minutes before you’re ready to serve it. 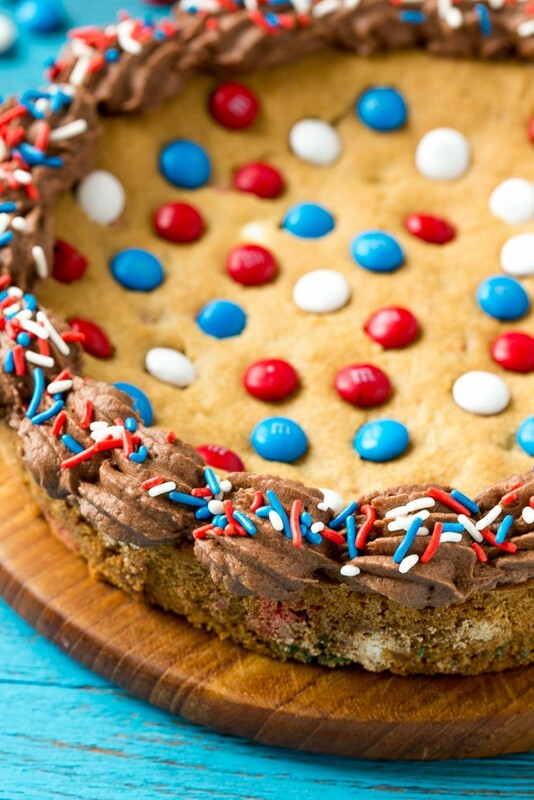 This red, white and blue patriotic cookie cake is the perfect sweet finish for barbecues, picnics and potlucks. I recommend bringing the cookie cake whole to your gathering for the full dramatic effect, then cutting it into wedges just before serving. I sometimes serve this cake with little bottles of milk, because we all know that cookies with milk is the ultimate food pairing! Regardless of how you serve it, this cake will be the hit of your party and the adults love it just as much as the kids do. Do you have any particular patriotic foods that you like to make during the summer? If you ask my family, this recipe is at the top of our list! 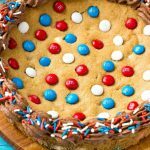 This recipe for a patriotic cookie cake is a giant brown sugar cookie that's loaded with red white and blue M&M's and finished off with chocolate frosting and sprinkles. The perfect treat for summer entertaining! Preheat oven to 350° F. Coat a 9 inch cake pan with cooking spray and line the bottom of the pan with a circle of parchment paper. Set aside. In the bowl of a stand mixer fitted with paddle attachment, beat the butter for at medium speed for 2-3 minutes or until light and fluffy. Add the brown sugar and granulated sugar and beat for 1 more minute. Add the egg, egg yolk and vanilla and beat for 1 minute. Scrape down the sides and bottom of the bowl with a spatula if needed. Combine the flour, baking soda and salt in a medium bowl. Add the dry ingredients to the butter mixture and mix on low until just combined. 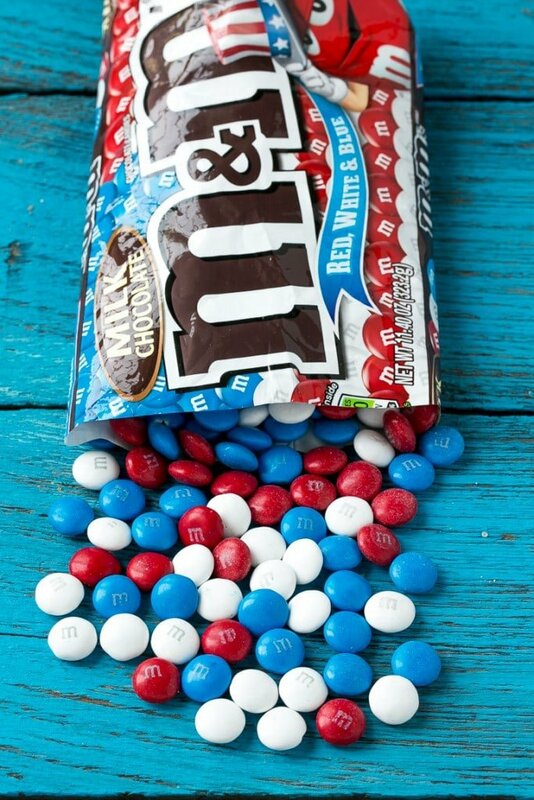 Stir in 1 cup of red, white and blue M&M's. Press the cookie dough evenly into the prepared pan. Sprinkle the remaining 1/2 cup of M&M's over the top of the cookie dough. Bake for 22-25 minutes or until the cake is golden brown at the edges. Place the pan on a cooling rack. Cool for 5 minutes then run a thin knife or spatula along the edge of the pan to loosen. Once the cookie cake has completely cooled, carefully invert the cake pan onto a plate, then gently flip the cookie right side up. In the bowl of a stand mixer fitted with a paddle attachment, beat the butter on medium speed until creamy - about 2-3 minutes. Add the cocoa powder and powdered sugar and mix on low speed until just combined. Add the milk and vanilla then beat at medium speed until frosting is smooth and creamy, 2-3 minutes. Pipe the frosting onto the edge of the cake and then decorate with the red, white and blue sprinkles. Place in the refrigerator until 30 minutes before it's time to serve the cake. Such a fun, colorful cookie! I love the way you have the M&Ms on the inside and out. Very creative and so fun for a U.S. holiday celebration! This is so pretty! What a perfect addition to the weekend holiday menu. Sharing! I’m thinking this cookie would be so good warm with some ice cream. That cookie makes my mouth water! Going to have to make it! I love these big chewy cookies and who doesn’t love M&M’s!